Tammy Anderson is a survivor of GYN cancer. In this video recordeed on August 29, 2016, she shares her message and encourages everyone to participate in A State of Teal. 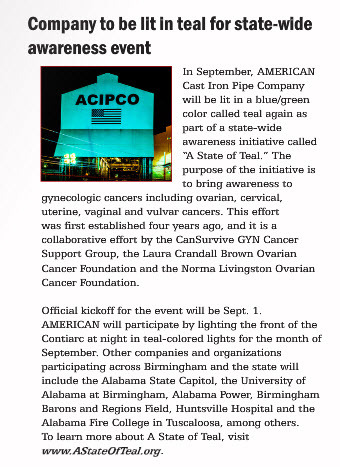 American (formerly ACIPCO) publishes a mention of their participation in A State of Teal in their September employee newsletter. 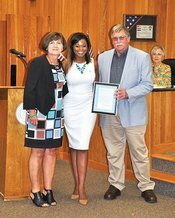 Thanks to the News Courier for reporting on the proclamation presentation by the Mayor of Athens on August 22, 2016. Click here to read the full story and for view photo. Thanks to Auburn University and for Jeff Shearer for submitting this September 7, 2016 article on Auburn Athletics online. Thanks to Karen Globetti, Jasper resident and ovarian cancer survivor, and to Cecilia Crandall, mother of Laura Crandall Brown, for providing an interview with reporter Jennifer Cohron. Click to view the article online. 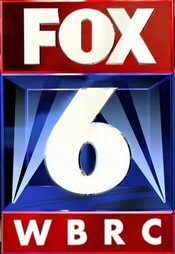 Read article submitted by reporter Stephen Dawkins providing coverage of the September 6, 2016 Hoover City Council meeting. 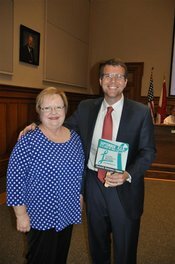 See online coverage here of Mayor Troy Trulock's visit to the Lilites of the Valley organization and proclamation presented. The Laura Crandall Brown Foundation and A State of Teal have joined with REV Birmingham to have the downtown tunnels lit in teal beginning September 6th. See the full article in a recent E-Newsletter published by REV Birmingham by clicking here. Beth has always been a supporter of the cause for awareness to GYN cancer symptoms. See her online story here. Thanks to Seth Holloway for his coverage of our initiative. Special thanks to Angel Coker for interviewing GYN cancer survivor, Sandra Reed, and publishing an article about our GYN awarness campaign. 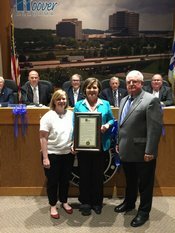 Read Emily Featherston's story covering the 2016 GYN Cancer Awareness Proclamation issued by Mayor BUtch Zaragoza at the August 22nd City Council meeting by clicking here. Read article by Keysha Drexel online here. If you drive on highway I-65 in North Birmingham, you will notice a beautiful sight! 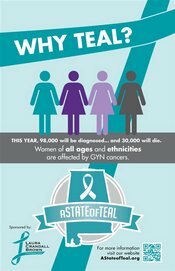 The large building seen from the interstate will be lit in teal for the entire month of September in honor of A State of Teal and GYN cancer awareness. Read this following article from the employee newsletter. ACIPCO (American Cast Iron Pipe Company), located on the north side of the city, is participating in a State of Teal by lighting up the large water tower located on the company's plant. Their participation is explained in their monthly newsletter issued on August 27th. Thanks to ACIPCO for their participation and helping us to spread awareness to GYN Cancer Symptoms during the month of September. Read the article and view photos here. Read full issue here (story on page 19). Or click to download this page in PDF format. 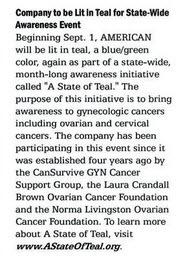 Kayla is hosting an Ovarian Cancer Awareness Event on Saturday, September 13, from 8AM until 5PM at the Verlie B. Collins Recreation Center in Sylacauga. Please join us in learning more about this disease. 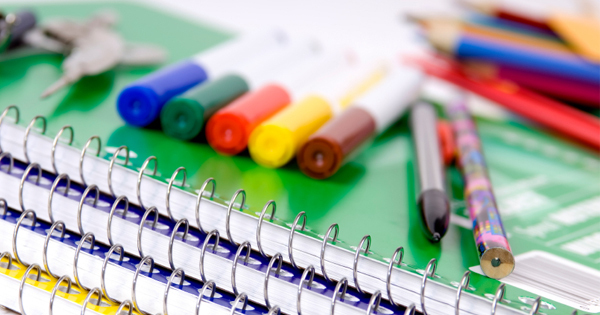 Read September 1 article submitted by Jean Cole here. Thanks to Phoebe Robinson for the great write up! Presentation of proclamation was made by Mayor Gary Ivey to Kelly Rice, Hoover resident and ovarian cancer survivor and Doris Moody, A State of Teal Committee Member. Sharing more about awareness and the importance of knowing the symptoms! A State of Teal Chairperson and ovarian cancer survivor, Kelly Rice, was interviewed on ABC 33/40's Talk of Alabama show about our upcoming event and her experience with the discovery of ovarian cancer. Appearing with Kelly was Dr. Monjri Shah, GYN Oncologist with Alabama Oncology. Click below to view their interview. 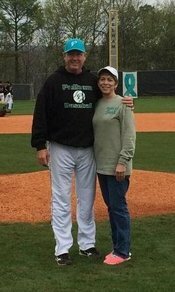 Present to receive the proclamation were ovarian cancer survivor, Shay McNamee, and Don Segars, husband of the late Bonnie Segars. Click here to read article submitted by Sydney Cromwell. 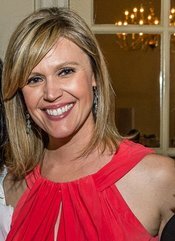 See Sarah McCarty's coverage online by clicking here. Read September 11 article by William Thornton in the Bimingham news here. Click to view September 1st Shelby County Reporter article online. Click to view September 2nd article in 280 Living. Click to read article online in the Daily Mountain Eagle. See East Alabama's website or click here to read the 9/1/14 press release. Click to read the article in the Shelby County Reporter. Read this wonderful write-up about Tammy and her cancer journey. Or you may read the full article by clicking this PDF file. Click to read article online. Click for photos and story. Thanks to Crystal Bonvillian for this great coverage in the Huntsvill Times. Click to read the full article. 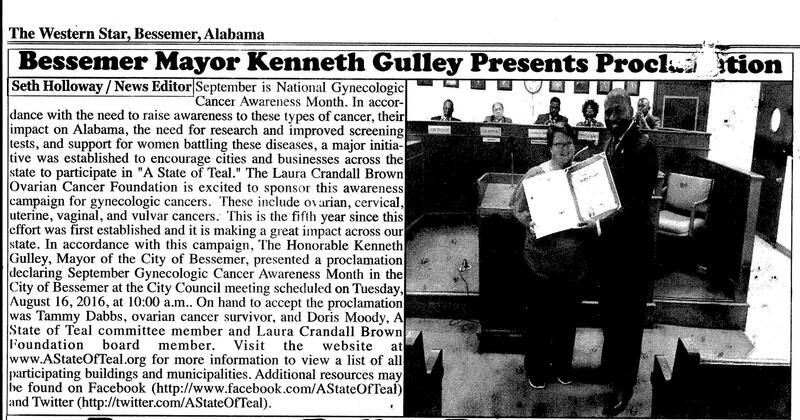 We appreciate the coverage provided by AL.com providing information to its readers about Mountain Brook's recent proclamation declaring September as GYN Cancer Awareness Month. Click the image to read the full article. Thanks to Mayor Scott McBrayer for his support! We are pleased to be mentioned in the Mayor's Minute and in the Homewood Star. Read the article below (on page 7 of this publication). Great write-up by Jesse Pease in the September issue of Village living magazine. For the full article and photo, click here.